The lard pot. In relation to today’s efforts to explore clay’s vast plastic potential, a momentary glance at this form says it all. A somewhat curvy cylinder. Big deal. But nothing is a big deal if you only take a moment to consider it. First, some history. The “pot” in question is differentiated from it’s primordial sibling the “pan” by being taller than it is wide. “Lard pot” is simply a reference to a specific function; storing festering, fly-covered animal fat for use in baking and cooking. The form served a wide variety of uses both in the U.S. and its original home in Europe and the British Isles. Several branches of the ceramic family trace their lineage to this original shape; handles led to pitchers; constricted rims became jugs; lids led to bean pots and ultimately casseroles… But the ‘lard pot’ as a distinct form continued throughout. 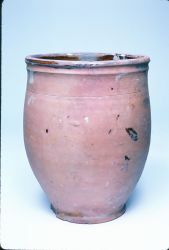 Actually this is one of the oldest items in the Anglo-American potting tradition. It was among the first forms to be made in England’s North American Colonies. It’s production lasted two millennia until it’s extinction a mere hundred years or so ago. So ubiquitous was this form that it’s difficult, by sight alone, to ascribe surviving examples to a particular period, place or maker. The staying power of such a shape – passing through so many generations of hands, so many clays, so many wheels, so many kilns, so many decorative fads, across so many war-torn country sides, buffeted by so many economic and technological storms – is something remarkable. The lard pot could be placed in a pantheon of archetypal pottery forms, along with other ‘long-distance runners’ like the Spanish/Muslim ánfora, the African beer pot, the Central American comal, and the Asian rice bowl. Unfortunately, the lard pot epitomizes the clumsy, pedestrian nature of popular contemporary conceptions of early Redware. But when executed in the hands of a master, it was a study in control. With no handles, spouts, lids – or even glaze – to hide behind, proportions were critical. The relation between base, belly and rim had to swell out enough for storage and ease of content removal, without being squat or dumpy. To make a “lard pot” today is to converse with all those potters who laid out the path before us. Feeling the old potters presence is a rare thing. But when it happens, you’re in good company. A Descriptive Dictionary for 500 Years of Spanish-Tradition Ceramics [13th through 18th Centuries]. Florence and Robert Lister. Special Publication Series, Number 1/The Society for Historical Archeology. 1980.